Why the "Mobile"? Because of the need for greater expertise and training, the neighborhood Notary has for the most part disappeared. We recall when there was a Notary in every neighborhood. Now, with the increasing demand for expensive insurance, record keeping requirements, and the growing complexity of the Notary laws and procedures it’s a full time job to “keep up”. In the hectic and fast paced environment of NJ it is often difficult and time consuming to find a Notary Public when you need one. We are traveling Notaries Public who are available 24 hours a day 7 days a week. And we come to YOUR location, by appointment, so your access to Notary services can be scheduled in advance and it is no longer difficult and time consuming to find a Notary Public when you need one. Our principals have a combined 35 years experience, advanced training, the best equipment, and a complete “back office” of support and backup personnel. 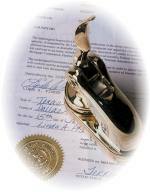 All to assure your documents will be notarized, and, if necessary, authenticated properly. Collectively, we have issued well over 40,000 Notarizations without a single challenge to a Notary Seal. We are not expensive, preferring to establish repeat business we keep our rates fair. We schedule intelligently. Some of our Principles have office facilities, others are retired and prefer to work evenings; late into the night. Our diverse backgrounds give us perspective; most of all we are from New Jersey. We have done rush Notarizations on the back of a Motorcycle as well as in the boardroom or hotel suite. We continue to innovate and expand our “product line” to meet the growing needs for the assurance Notarized documents provide.